This spring, spruce up your home with a fresh coat of paint! Your molding has a significant impact on the look and feel of your space. In fact, dirty or chipped trim can quickly make your space feel dated and uncomfortable. Even if you decide to repaint your interior walls a bright new hue, it won’t make a huge difference against old baseboards and trim. Therefore, to get the most out of a new room, you want to make sure that you keep your home’s molding in tip-top shape with some new paint. Here are a few tips to use to spruce up the molding in your home. Ideally, you’ll want to stick with bright and white colors for your trim. In fact, using white baseboards and trim is a great canvas to highlight other aspects of a room. A clean and fresh white is a perfect starting point for you to refresh your space for your specific needs. Choosing a beautiful white or a subtle off-white is a wonderful choice that provides you with versatile options for your interior design. When it comes to baseboards and trim, you will want to pick semi or high gloss interior paint. In fact, since baseboards and trim deal with a lot of wear and tear you will want to find paint that can withstand it all. Being able to easily wipe down these surfaces is essential in any home, especially one with lots of children or pets. One of the biggest decision many homeowners will have to make is whether or not to repair or replace any broken baseboards or extremely chipped trim within their homes. In fact, repairing dents to your trim is one of the best ways to make it last a long time. 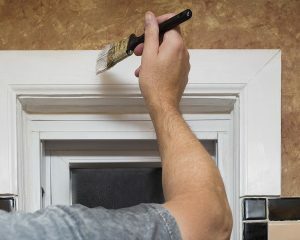 Extending the life of your trim is what all homeowners seek when embarking on a refresh project. Therefore, understanding when it’s time to update trim or completely replace your time is essential to refreshing any room in your home. Do you need some great Benjamin Moore paint to get started on your exterior painting projects? Columbia Paint Company is your one-stop shop for all of your home-decorating needs in Howard County. From fabulous Hunter Douglass window treatments to beautiful Benjamin Moore paint products, we have everything you need to make your dream home design a reality. Schedule an appointment with our design consultant today!